Pod borers | Infonet Biovision Home. 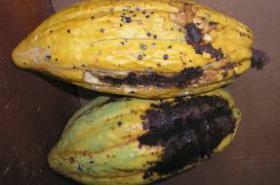 Pod-borers are serious pests of cocoa. The pod husk borer (Characoma stictigrapta) for example, occurs in West Africa. The damage is done by the larva which bores holes into pods of all sizes. 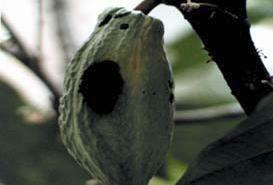 It produces a mass of frass held together by silk at the entrance of the holes. If the pod is very young and soft (cherelle) then it wilts. The insect is usually not controlled. Simple cultural methods, such as adjustment of shading level or improved soil drainage, will contain many of the most troublesome pests including pod borer.